Einstein's theory of general relativity has passed its toughest test to date after scientists showed gravity works as expected – even at immense scales. Some physicists had argued the German-born academic's idea that all falling objects accelerate identically would not apply in regions under extreme gravitational forces. However, scientists studying a trio of stars 4,200 light years from Earth – one of which exerts a gravitational pull two billion times stronger than that on Earth – found the system's phenomenal forces had almost no effect on the acceleration of each star. This means Einstein's theory once again holds true, while a number of alternative models of the universe, including some versions of string theory, are now ruled out. Einstein's famous theory, penned in 1915, states that all objects fall the same way regardless of their mass or makeup. It's the reason a cannonball and apple simultaneously dropped from the top of a skyscraper will always hit the ground at the same time. But while this model proves correct in many situations - including here on Earth - scientists did not know if it would hold true in the cosmos. Some physicists predicted alternative theories of gravity would apply under these extreme forces. 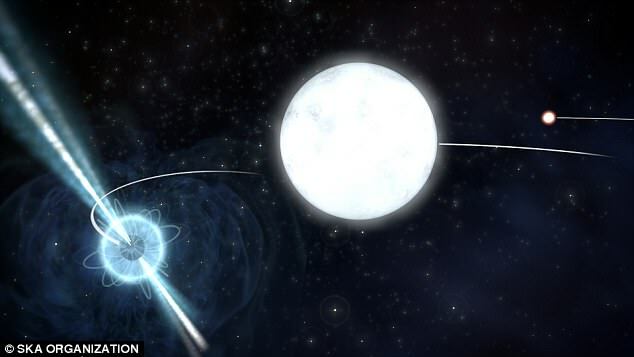 To test the theory, an international team of scientists took readings of a distant three-star system known as PSR J0337+1715, which is made up of two white dwarfs and a neutron star. 'This is a unique star system,' said Ryan Lynch of the Green Bank Observatory in West Virginia, and coauthor on the paper. 'We don't know of any others quite like it. White dwarfs are incredibly dense: While they are similar in size to Earth, their mass is comparable to that of the sun, making their gravitational pull incredibly strong. Neutron stars are even smaller and denser than white dwarfs, comprising a sphere about the size of Amsterdam with a mass one and a half times that of the sun. They are made from collapsed cores of stars that have undergone supernova explosions and are the densest stars in the universe, with some speculating their gravitational pull is two billion times stronger than that seen on Earth.